They're the diabolical brainchild of Solve Media, a New York-based startup that's looking to shove something people typically don't want to look at—ads!—into a space where people are routinely forced to look—captcha boxes! For some reason, this ungodly pairing makes both of these individually tolerable things a little more loathsome in my eyes, kind of like a combination Pizza Hut Taco Bell. 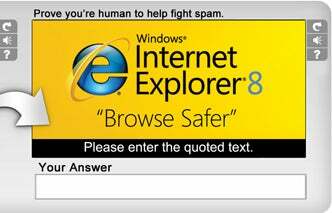 But as Solve sees it, they're doing you a favor, what with how hard it is to read captchas these days anyway. Which is actually kind of true. So now the question becomes, what's more frustrating: having to squint to distinguish if a character is a squiggly oblique "q" or a squiggly oblique "g," or being assailed by an Internet Explorer ad where there once wasn't one.